If you have money and opportunity, then certainly Bugatti Veyron is the car that will adorn your garage and show off your taste and class in style. Bugatti Veyron is the super car that comes with the fabulous price tag of $1,700,000, almost £810,000. 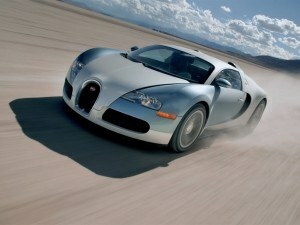 Quite simply the super car Bugatti Veyron is the most expensive and fastest sports car that money can buy. With a top speed of just above 250 miles an hour, you will be pleased that the car has an incredible rear spoiler that raises and works as an air brake. It speeds up from 0 to 200 miles in just 14 seconds! That equals with the amazing speed of a fighter jet. Inside the super expensive luxury car, you will find leather surroundings and covering of brushed aluminum. If money is not an object, then this is the car for you. You can drive it on normal streets, it is legal.